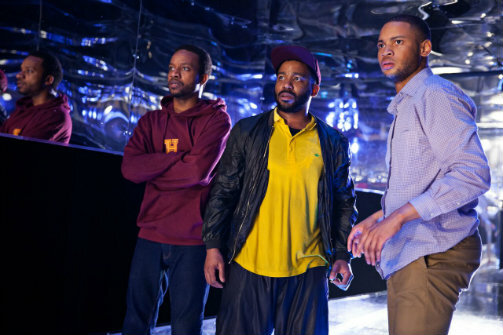 Donnell E. Smith, Clinton Lowe, and Ryan Swain in Kill Move Paradise. Photo by Christine Jean Chambers. BOTTOM LINE: An experimental theatre piece about black men killed by the police, Kill Move Paradise is both a meditation on what happens after death, and a celebration of the richness of life. Black lives matter. That such a phrase is controversial, and that black folk continue to be killed by police on an almost daily basis, only shows how far we are from true social justice when it comes to matters of race. If there is such a thing as “Black Lives Matter Theatre”—I suspect such a category will become coherent soon, if it isn’t already—then James Ijames’ Kill Move Paradise is certain to be a key work. And what’s perhaps most striking about this piece is that it shows that theatre about men killed by the police can be thoughtful and even celebratory, rather than just depressive or rage-inducing. Well, what’s striking at first is Maruti Evans’ genius set. Although this was my first trip to the National Black Theatre, I am certain it has never looked like this. The playing space is an enormous metal chute, almost as if we’re observing the inner workings of a giant meat-processing plant—an apt metaphor for how black folk in the U.S. have been treated for the past four hundred years. With the audience on two sides peering through plexiglass, there would seem to be no way into the space; how the actors enter is one of the evening’s many surprises. As we enter to take our seats, one man—Isa (Ryan Swain)—lies dead on the floor. Once he wakes up, he struggles to figure out who he is, what happened to him, and what the hell is going on. Soon Isa is joined by Grif (Donnell E. Smith), and then Daz (Clinton Lowe). As the three men piece together that they are in some sort of post-death way station to prepare for their final transformation, they are joined by Tiny (Sidiki Fofana), who is painfully young to be in such a place for such a reason. (If I have one critique, it’s that Fofana seems to be more or less the same age as the other three actors, rather than what Tiny is described as—a child who had been playing with a toy gun). The men realize that they cannot progress unless they do so together (one of many metaphors for social justice threaded throughout), so they must find a way to help Tiny realize what has happened to him. To be clear, although Isa reads a list of real names at one point, these are fictional characters. And we don’t learn much about the lives these four men left behind; if it weren’t for the actors and Ntokozo Fuzunina’s subtly nuanced costume design, we wouldn’t know much about them at all. But such lack of specificity is somehow ok here—it allows these characters to function as everymen, standing in for all of their brothers (and sisters) who have been sacrificed to a society that values white feelings over black lives. Such subject matter could easily become heavy, but this team wisely chooses to focus not on the tragedy of death, but on the vitality of life—there is much “play” in this play, especially during the second half. All four actors are excellent, and manage to create specific characters from a script that is more experimental than expositional. It’s a deeply physical piece (the terrific movement is by Darrell G. Moultrie) with several references to Greek mythology—one highlight is when Cerberus makes the obligatory appearance. And then there’s the spot-on recreation of the opening to a certain 80s sitcom about a “relatable” black family. Also worth mentioning is the clever lighting design by Alan C. Edwards, and especially Palmer Hefferan’s powerful and eclectic sound design; director Saheem Ali has assembled a first-rate team, and the result is enjoyable, stirring, and (perhaps most difficult with this kind of theatre) never confusing. Kill Move Paradise is by James Ijames. Directed by Saheem Ali. Set Design by Maruti Evans. Lighting Design by Alan C. Edwards. Costume Design by Ntokozo Fuzunina. Sound Design by Palmer Hefferan. Movement by Darrell G. Moultrie. Musical Director is Darius Smith. Production Stage Manager is Christina Franklin. Assistant Director is Adrian Alexander Alea. The cast is Sidiki Fofana, Clinton Lowe, Donnell E. Smith, and Ryan Swain.